2) Steven Toumi / ? / September 1987 / ? 3) Jamie Doxtator / 14 / ? / ? 4) Richard Guerrero / ? / March 1988 / ? 6) Edward Smith / ? / June 1990 / ? 7) Ricky Lee Beeks / ? / July 1990 / ? 8) Ernest Miller / ? / September 1990 / ? 9) David Thomas / ? / February 1991 / ? 10) Curtis Straughter / ? / February 1991 / ? 11) Errol Lindsey / ? / April 1991 / ? 12) Anthony Hughes / ? / May 24,1991 / ?
" What I had done is very serious.I've never been in this position before.Nothing this awful.This is a nightmare come true for me.If anything would shock me out of my past behavior patterns,it's this.The one thing I have in my mind that is stable and that gives me some source of pride is my job.I've come very close to losing it because of my actions,which I take full responsibility for...all I can do is beg you,please spare my job.Please give me a chance to show that I can,that I can tread the straight and narrow and not get involved in any situation like this ever again...this enticing a child was climax of my idiocy...I do want help." " It's hard for me to believe that a human being could have done what I've done,but I know that I did it." " It is now over.This had never been a case of trying to get free.I didn't ever want freedom.Frankly,I wanted death for myself.This was a case to tell the world that I did what I did,but not for reasons of hate.I hated no one.I knew I was sick or evil or both.Now I believe I was sick.The doctors have told me about my sickness,and now I have some peace...I know how much harm I have caused...thank God there will be no more harm that I can do.I believe that only the Lord Jesus Christ can save me from my sins...I ask for no consideration." On July 22,1991-around midnight,two officers were sitting in they're patrol car when a man named Tracy Edwards stumbled up to them with a handcuff dangling from his wrist.He told the officers of a "weird dude" whom had handcuffed him inside an apartment against his will.Edwards showed them back to the apartment 213 at Oxford Apartments.Inside the apartment,Dahmer was calm as Edwards pointed out that there was a large knife that he had been threatened with in the bedroom,the officers decided to take a look;in the bedroom they found photographs of dismembered body parts-they put Dahmer immediately under arrest. 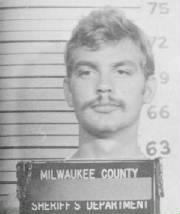 The jury at trial found Dahmer guilty and sane at the time of the murders,he was sentenced to 15 life sentences to be served back-to-back(957 years).Dahmer spent most of his time isolated from other prisoners for his safety,but Dahmer requested to be among other prisoners-in which Dahmer was granted to eat in the cafeteria and work on a prison janitor workteams.On November 28,1994-while Dahmer was on work detail,prison guards left him with two other prisoners(one whom was schizophrenia and believed himself to be the son of God-Christopher Scarver).When the guards had returned,Dahmer's skull had been crushed in with a blunt object by Scarver.Dahmer was pronounced dead at 9:11am.